Thank you to everyone who commented, emailed, and tweeted about what you wanted to see from the airlines regarding loyalty programs. I joined with Nicholas Kralev from the Washington Times on Friday morning up on the stage to tell the crowd what you said. Did they listen? I’m sure some did, especially since data connections on BlackBerries didn’t seem to be working so well. That doesn’t mean anything is going to change, of course. At least we were allowed to say things as we saw them and nobody pulled our mikes away from us. In all of your comments, I saw three main themes relating to loyalty programs (some of you strayed a bit too far into other areas for this conference). Many of you said you were fed up with all the complex rules that have evolved over time in some of these programs. No airline employees actually spoke up when we tried to get feedback during the conference, but we did have other attendees jump into the conversation. Nicholas asked why there had to be so many small differences between some programs that simply made it difficult to grasp all the rules, and one person stood up to say that it was a balance between fairness and simplicity. I explained that there was an understanding with customers that the simplest program (fly 10, get 1 free, for instance) isn’t always the best way to do things, but there are some things that don’t make sense even in that framework. For example, the last minute award bookings fees that Seattle Sleeples mentioned may make sense in the context of revenue management, but from a pure customer perspective, they can’t really be justified. The disconnect is the problem there. I didn’t try to single out United, but that ended up happening more than once. One area where this came up was in regards to creating value for elites. (Thank you, United in Denver, for mentioning that in the first comment.) United’s recent decision to sell premium amenities to anyone is a perfect example of elites feeling like they aren’t being valued. Chris also echoed this concern in his desire for customer appreciation events. People want to feel valued, and some people, like asad, don’t feel they’re looking at lifetime value very well. Someone spoke up saying that people are used to being rewarded with miles so airlines aren’t going to change that. Of course, some are, including JetBlue with their new spend-based model, but either way people end up being rewarded for the wrong behavior. People may fly a lot of miles on a $99 fare and end up not being very valuable to the airline at all, but they end up reaping the rewards. This goes back to that whole fairness vs simplicity argument. The last point was one that I thought was expertly explained by Gary Leff from View From the Wing. In fact, I pulled up his comment on the big screen and started reading from it directly. So, I’m going to republish that here. Those sound old fashioned, but I’m serious. Bear with me. Don’t talk about ‘enhancements’ that are really devaluations. Your customers resent being lied to. Offer a clear value proposition and STICK TO IT. I disagree with @Chris who says no devaluations. Just be clear about what you are doing and give PLENTY of notice. So that there’s a clear connection between an offer, customer behavior, and a reward. When you offer benefits, customers fly to earn those benefits, and you change the rules of the game just as they’re about to experience those benefits… #FAIL … seriously. So declare by the end of February, 2010, say, what the 2011 program will look like. And stick to it. In this same light, I agree with @Chris, though, that there is good online social media communication from a couple of companies like Starwood. Engage your customer, honestly and transpanretly. With a strong customer service presence and not a marketing, PR, or spin shop. Tell the truth. Declare it openly, warts and all. And then deliver on your declarations. And your customers will love you for it. Surprisingly, the one thing we failed to bring up was the Starnet blocking that United engages in. It’s particularly funny that we didn’t mention it since Nicholas wrote a column that effectively thrust this into a wider spotlight. But we got so caught up with other examples of lying about something being done to “enhance the customer experience” that we ended up running out of time. I know someone asked for a video, but I don’t think it was taped. If I find a video, I’ll post it. Thanks again for all the feedback, and hopefully this had some impact. Well people have been used to being able to check bags and get a meal no matter the cost of the ticket without having to pay extra, but the airlines sure changed that with no problem. OFF TOPIC: Cranky this Sundays paper had a story in the travel section about all the travel info via blogs that people can use. The Cranky Flyer was one of about a dozen that was mentioned. The Bay Area New Group owns a few papers in the area so if anyone wants to see it, here’s the link from the online San Jose Mercury News. Hmmmm – would’ve loved to hear about Starnet – too bad time ran out. I think it’s a perfect example of deceit from United that’s often only feebly justified. Just to be clear, this wasn’t an airline employee saying this. This was one of the other folks in the room who was willing to stand up and engage in a discussion about it. With the short time we had, it was definitely a simplification, but he had a good point. OFF TOPIC: Cranky this Sundays paper had a story in the travel section about all the travel info via blogs that people can use. The Cranky Flier was one of about a dozen that was mentioned. I’m still as loyal as ever, but this year I am really starting to question my loyalty, and if it is all worth it anymore. I don’t appreciate being nickel and dimed. As an elite member, I’m not immune to little fees anymore, but I feel i should be. I don’t feel as valued anymore. Thumbs down to Delta taking away my NWA program. Nice write up and good job getting the main points out of the comments, I wouldn’t have been able to put it as succinctly as you did. Did anyone mention how corporation cutting down on business travel has affected the airlines ? I know a lot of convention locations are hurting because of canceled conferences but has this come up all the way to the airlines ? I can see United wanting people to book a flight on them before they book one on the partner airline. But Kralev’s article doesn’t make clear if United actually flew the route he was trying to redeem on Lufthansa. That being said, it is a little shady, especially the UA agents stating “Several United agents tried to explain the discrepancy by saying that Star carriers give different award inventory to the individual alliance members” This is part of the problem, they’ve gotta put the same information out everywhere, not just in the press, but also to the CSRs. United may just be the worst run airline in the Western Hemisphere! When the CEO (at a share holders meeting) tells its #1 flier (by revenue) that if he does not like what the airline does, he can fly another carrier. A response, to a very simple and politely asked question. It tells the whole story there. So will some airlines listen, a little. Will UA. No! Starwood has ALWAYS been beyond amazing!!! Glad to know I brought up a good point. I just started traveling seriously for work within the last year, and I picked United as it is the hub carrier in Denver. Now I’m starting to wish there was another choice. That has been a theme at almost every conference lately. It’s a huge issue for the airlines, and many think it will never come back – companies will start doing business differently now. So yeah, there’s always plenty of discussion around that. Living in Denver, you have more options than just about anyone else in the country! 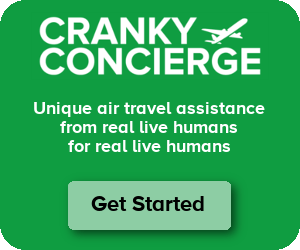 My biggest client has all but said corporate travel will be minimized as much as humanly possible. Thus I’m not getting any status this year and have spent much time on video and teleconference calls. It is what it is. Brett – thanks to you (and Nicholas) for providing exactly what I was looking for as the conference chairman. The real customers viewpoint. Your session was one of the most talked about and the one that I have had a lot of positive feedback about. So, I hope for many of the airlines in the room they heard what you were both saying. It was great that you were able to put the question out to your readers and get them to input effectively “live” to the conference. A very neat way to connect the audience to their customers.